When Chris Vandergriff wrestled at Halls High in the mid-1970s, Carter was the only other high school in Knox County that had a wrestling program. Over the years, that has changed a lot and Vandergriff has had a lot to do with it. For that reason, plus the fact that Vandergriff was a two-time TSSAA state champion and a longtime coach at his alma mater, Chris is being inducted into the Greater Knoxville Sports Hall of Fame this year. Vandergriff went on to letter four years at UT and finished in third place in the SEC tournament’s unlimited weight class as a freshman. He was an assistant coach his first two years at Halls and then was head coach for 23 years, guiding the Red Devils to the State Dual-meet finals and 305 Dual-meet wins. “His accolades as a state champion led to the aspirations I had as a high school wrestler,” said Shannon Sayne, the current Halls wrestling coach. “I looked up to him. Vandergriff has really never left the sport. “Chris has done a lot for the sport across the state and mainly in the East Tennessee area,” said Sayne, who himself was a two-time state champion and has been Halls’ coach for 13 years. “He’s done camps for teams just starting programs. In recent years, Vandergriff has helped First Baptist Academy in Powell start a wrestling program. Vandergriff also has put together and keeps a current contact list of coaches for the entire state. “That’s another selfless act to help out wrestling across the state,” said Sayne. That contact list is not only beneficial to coaches; it has created a bond for the sport. 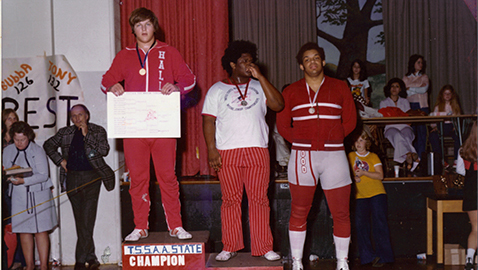 “There’s no doubt he’s a pioneer for wrestling in the state of Tennessee,” added Sayne. Vandergriff also has developed and continued middle school and kids’ wrestling programs in the Knoxville area. He was inducted into the Tennessee Chapter of the National Wrestling Hall of Fame and received the “Lifetime Achievement” award in 2007. The 37th annual dinner and induction ceremony will be held Aug. 7 at the Knoxville Convention Center. R.A. Dickey, former UT pitcher and the 2012 NL Cy Young award winner, will be the guest speaker. Other members of the 2018 Hall of Fame class include Alcoa football coach Gary Rankin, former UT track athlete Tony Parrilla, former UT and Central baseball player Bubba Trammell, former Fulton football coach Buck Coatney, former Webb basketball coach Elliott Stroupe, former UT and Austin-East football player Joey Clinkscales, gymnastics coach Lisa Savage, local golfer Rock Saraceni and track and field official Stanley Underwood. Proceeds from the event benefit the Boys and Girls Clubs of the Tennessee Valley, which include 8,300 youth at 15 club sites.